Reddish buds open to single pink flowers, aging to salmon-pink, with white centres and reddish gold stamens. Repeat flowers throughout summer. Slightly fragrant. Graceful, vigorous habit and stems with few thorns. Borders and may be used for hedging. 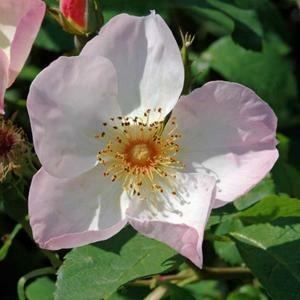 Appearance is reminiscent of the wild rose, but with the benifit of repeat flowering.